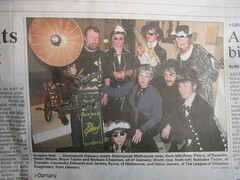 Euchronia organising committee members Cassandra and Jeremy's adventures with fellow steampunks in Oamaru have been blogged about extensively on the Antipodean League site, take a look! We received some lovely local press from our visit, including the Oamaru Mail and the Otago Daily Times which has been great early exposure across the Tasman for Euchronia! We are very excited to develop a stronger relationship with our sister League across the ditch. The committee are also making a final call for applications for the Artisans' Bazaar; time is running short to be part of this new feature of Euchronia. We've noticed quite a flurry of ticket sales in the last couple of days, I think folk are getting quite excited - as are we! Look out for more announcements from us over the next week!